The turf war to see takes control of drug trafficking in one of Rio's largest favela comes a day after another confrontation in the Northern region of town. RIO DE JANEIRO, BRAZIL – Dozens of security officers entered Rocinha, one of Brazil’s largest favela communities, early Monday morning to try to arrest the leaders from rival drug gangs, responsible for hours of gunfire and tension on Sunday. Brazilian Military Police officers entered Rocinha community in the early hours of Monday morning, photo courtesy of PMERJ. Rival groups are reportedly battling to see who takes control of the drug trafficking business in Rio’s most notorious favela, putting residents in the middle of a deadly turf war. It was still dark outside when men from the Military’s Special Operations Command pulled up at one of the entrances of the community. The men went into the upward narrow alleyways of the favela while men from the Pacifying Police Unit (UPP) and the local military battalion surrounded the community in case gang members tried to escape. 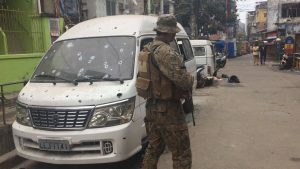 According to the military command, once these officers have secured the area, civil police agents will enter the community to serve arrest warrants. During Sunday’s clashes officials report that at least one person died and three were injured due to gunshot wounds. An UPP team was also attacked by the group trying to take over the drug trafficking business in the community. Early Sunday morning Rio’s military police Twitter account warned residents to stay indoors “Clashes between traffickers in Rocinha. Officers trying to stabilize region. Avoid the area,” read the message. Two accesses to the São Conrado metro station near the entrance of the community were closed for about an hour as shots were heard from inside Rocinha. The eruption of clashes between rival drug gangs in Rocinha comes a day after another community in the Northern region of the city faced two days of heavy gunfire. Residents at the Juramento favela community were afraid of leaving their homes on Friday and Saturday due to the intensive gunfire that left seven dead in the area.